For some added traditional style in your bathroom, choose this beautiful vanity. This piece comes with a beautiful brown solid wood base and a white marble counter. The simple look of the double-door cabinet and drawers is useful and classic. This set from Wyndham Collection is great for anyone looking for great style and function in their bathroom. 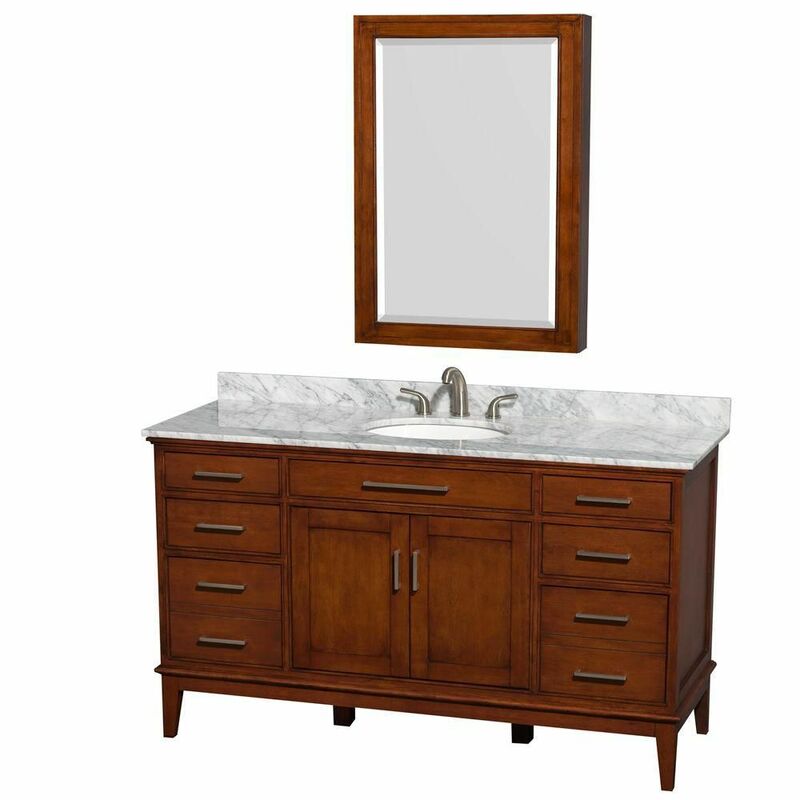 Hatton 60-inch W 6-Drawer 2-Door Freestanding Vanity in Brown With Marble Top in White With Mirror For some added traditional style in your bathroom, choose this beautiful vanity. This piece comes with a beautiful brown solid wood base and a white marble counter. The simple look of the double-door cabinet and drawers is useful and classic. This set from Wyndham Collection is great for anyone looking for great style and function in their bathroom. Hatton 60-inch W 6-Drawer 2-Door Freestanding Vanity in Brown With Marble Top in White With Mirror is rated 5.0 out of 5 by 4. Rated 5 out of 5 by Sky from Better than expected. Unit includes slow close doors and drawers. Nice! Well built and heavy. Qua... Better than expected. Unit includes slow close doors and drawers. Nice! Well built and heavy. Quality product. Rated 5 out of 5 by Michael from Quality construction !... Quality construction ! Rated 5 out of 5 by JJ from A Quality Piece of Furniture Overall I was very happy with this purchase, this vanity is a high quality piece of furniture, came well packed and had no shipping damage. All doors and drawers are the soft close type and the vanity came with two sets of handles, brushed chrome and copper color. A few things would have made my self installation experience even better. I would have preferred that the back not have had a pre-cut opening for the plumbing. As it turned out my plumbing was offset about 8 inches from center so I had to remove the entire back cover to install the vanity in the existing space. The other thing is that the 24" by 36" medicine cabinet is huge! In order to make room for it I had to move the light fixture up 5" to get enough clearance for the faucet to fit underneath. It also came with only 3 glass shelves with the provision and mounting hardware for a fourth shelf. With such a large cabinet 3 shelves look lost... they should have included 4 shelves. Other than that, it was a breeze to install and a great addition to my new home's décor.